Although fiddler Allan Block faded from view during the last decade of his life due to a lengthy illness, news of his death this past fall traveled quickly, and people shared stories and recollections (often humorous) of how Allan touched their lives both as an individual and as a mentor. One week after his passing I found myself at Fiddle Hell down in Concord, Massachusetts. During an afternoon jam session headed by Boston fiddler Alan Kaufman, longtime dance musicians such as George Fowler and Art Bryan volleyed “Allan tunes” amongst themselves—“Big Sciota,” “Georgia Railroad,” “Ebeneezer,” “Rochester Schottische,” and many more. I could think of no better tribute to his life and influence. Allan started life as a classical violinist back in Oshkosh, Wisconsin. His great-uncle Nathan, a Jewish immigrant from Lithuania, was a violinist himself, and often came to the house and played music with Allan’s father, a pianist. Allan became a fairly accomplished violinist—he proudly recalled tackling the Mendelssohn Violin Concerto in E minor at age 11 or 12, and being one of the first youngsters to play live over the radio in Madison. In fact, the radio was a major factor in the development of Allan’s musical tastes: he loved hearing “Music Americana,” as he called it. He fondly recalled radio music hours on Saturdays and Sundays that were filled with the American pop music of the 1920s, by Al Jolson, Rudy Vallee, and Bing Crosby, or the lively concoction of music, story, and wit from performers like Eddie Cantor and Jack Benny. In 1948 Allan found himself in New York, married and having children to support. He found that he had a fine coordination between eye and hand. He.could look at a piece of leather, wood or metal, see what needed to be done, and do it. He could see something that was already made and figure out how to make another. In 1950 a Greenwich Village leather shop came up for sale and Allan borrowed the necessary $1,200 to buy it. Musicians started hanging around the shop. Old timey musicians, folk musicians. Ralph Rinzler, John Cohen, Woody Guthrie, Pete and Mike Seeger, Lee Hays, Freddie Hellerman and Cisco Huston – the shop became a place for these people and many others to come and jam when they were in town. After a while Allan joined in with guitar, banjo, and sometimes fiddle. John Cohen, Mike Seeger and Tom Paley formed the New Lost City Ramblers, and Allan frequently joined them, absorbing, and waking up to a heritage that went beyond his childhood. When the New Lost City Ramblers were forming, John Cohen had loaned Allan a tape of the Ramblers’ music. Allan was soon fiddling, playing the banjo, and singing the material in his shop. Saturday became folk music time at the shop. There was no singer-songwriter music and scarcely any bluegrass. It was old-time mountain music, played in a style that approximated the original. Bob Dylan dropped by several times during his early days in new York. He sat on the high work counter, smiling, saying very little, and soaking everything up like a sponge. 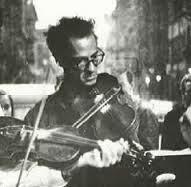 Allan eventually became the reigning impresario of the incredibly vital folk revival scene in the West Village, hosting regular Saturday afternoon jam sessions in his sandal shop after music in Washington Square was banned (something about a “no loitering” law). Bursting with enthusiastic musicians and fans, the players and spectators literally spilled out onto the sidewalk while the center of the room steamed up from the intensity of the music as Allan held court and directed. Everyone knew his thing was “holding down the beat”, and from time to time an excited musician would receive a gruff reprimand as Allan snapped, “Speeding up!” while casting a grave eye at the offender. One then had to pay sharper attention to his stomping foot, which pounded out the beat like Big Ben, seemingly setting the standard for worldwide time. If Allan was a bit imposing with his fiddle and his watchful eye, he was also a catalyst for those eager to share in a truly historic musical transformation that was to be part of the wider phenomenon of renewed interest in American roots music. In 1969 Allan moved to New Hampshire, native land of his new wife, Fleur. Allan left his now thriving sandal shop to his children (who ran it until 1979) and set up shop in a barn adjacent to the old Cape that he and Fleur had bought. Soon Allan was going to dances, and it was in New Hampshire that the fiddle really came out. Allan would sit in with the band, and once Dudley Lauffman found out he could read music he provided him with the scores for all I the old dances; HulI ‘s Victory, Rory O’More, Ladies Walpole (or Lady Walpole’s) Reel, Chorus Jig, and Petronella. Soon Allan became a regular sight (and sound) at dances.